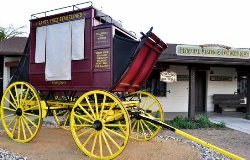 The Santa Ynez Valley Historical Museum and Parks-Janeway Carriage House celebrate the rich history of the Santa Ynez Valley, its pioneering settlers and the five early townships that formed the foundation of this unique region. Through its collection, exhibits and educational programs, the Museum honors the Valley’s past for the enjoyment of generations to come. See our website for a current list of exhibitions. The Santa Ynez Valley Historical Museum is also available for special events. Rental fees are very competitive and our friendly staff works with you to make everything perfect for your special event.